Fast forward to the first Friday of September. It’s evening and we’re leaving Zagreb for a 2.5-hour drive toward Bihać. This small and pleasant town in northwestern Bosnia and Hercegovina, by the border with Croatia, sits on the banks of Una River. We arrive after 9pm and meet Almir, our man in Bosnia. After unloading at the B&B where we booked our one-night stay, Almir takes us for a stroll through town. It appears to be a young, vibrant and friendly place. We have dinner at a riverside terrace of a hotel restaurant, right by a small waterfall. This is where I realize that water is the lifeline of Bihać, its strength, its potent power. In and around town, it’s all about river, streams, springs, rapids, and waterfalls. We spend the night at Teta (Aunt) Bogdanka’s place, a recommendation by another Bosnian friend. I have a fantastic night’s sleep in one of the neat, clean and tidy rooms of her recently opened B&B, where per person rates are just €10! This is definitely the place to stay if you find yourself in Bihać. Teta Bogdanka doesn’t speak English but she’s such a friendly and motherly character that you’ll find a way to communicate, no doubt. This is the address to look for: Đačka Ulica 51, near the high school. Bogdanka works in the ground-floor store so peek in during opening hours or call one of her numbers to book (387-37-312-904/387-37-312-896). We wake up the following morning to gray overcast skies and insistent rain. Not ideal weather for a day of on the river! But there we are, trying to invite at least a ray of sunshine to pierce through the clouds. Almir comes to pick us up for a drive to the village of Lohovo, a few kilometers out of town, where our rafting adventure begins. 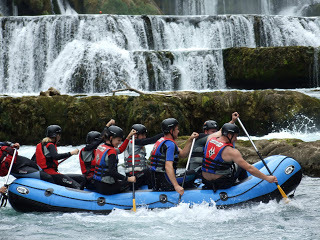 A few words on the rafting agencies in Bihać. While there are several in town (a google search will testify), some operating for over ten years, not all are trustworthy and respectful of the river. I was lucky to get insider advice that took me to Green River Rafting, the best and most professional of the outfits in the area. Their overnight package costs between €75 and €100 per person (depending on the group size and season), with two breakfasts (on the day of arrival and departure); a day of rafting; all equipment; and a dinner with party. And it’s totally worth it. Upon arrival to Green River Camp, we are served a hearty breakfast of locally made cold cuts and cheese and homemade bread. After filling up for the day afloat, we’re given the gear – neoprene suits and slippers, life jackets, and helmets. 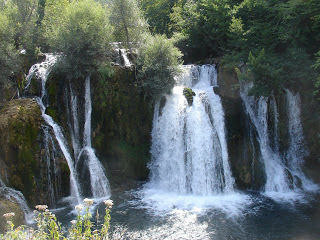 We then board a bus that takes us to the kick-off point: Štrbački Buk waterfall. Here, we are briefed by our skipper and board the rafts. And this is where pure fun starts – an adrenaline-charged adventure that made me feel like a child who just discovered a new endlessly amusing toy. 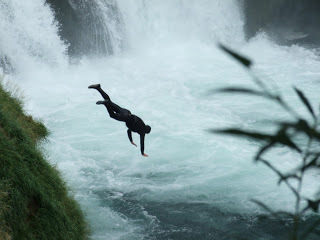 At every waterfall we descend and every rapid we go down on, we all scream with joy and, admittedly, a little fear thrown in too. Especially after seeing several rafts behind us capsize! But risk is part of the fun. The escapade lasts almost five hours. The entire time there isn’t a drop of rain. The rain gods smile at us. Even some sun rays peak through. After about two hours, which are the most action-packed part of the trip, it is all about paddling, paddling, and more paddling – a serious workout for all eight of us in the raft. 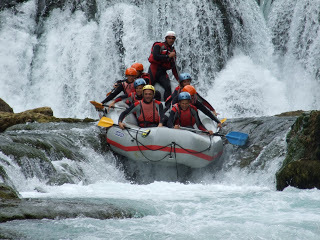 In April, which is the prime time for rafting on Una, there’s less paddling involved since the water level is higher, the rapids stronger and the current just carries you downstream. We went toward the end of the season, when the grade drops to 2-3. This meant we had to even get out of the raft a couple of times and walk through the river to avoid the shallow parts. Plus there was more paddling. 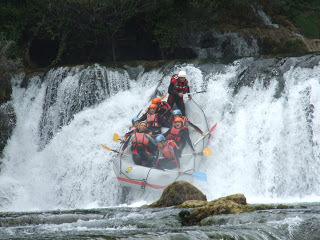 I’m now aching to go back next spring, to experience some real-deal grade 3-4 rafting. 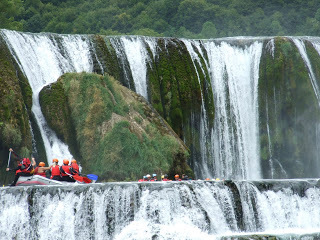 After the last waterfall descent, with 17 kilometers of paddling behind us, we come to the end of the river journey. It’s only then I realize that I am freezing cold, with bluish lips. We walk back to the base camp, where we warm up and enjoy a dinner of barbecued meat (including delicious ćevapčići, small and spicy ground meat sausages), potatoes and salad. I give in to the river and collapse around 10pm while the party downstairs, fueled with beer and rakija (a strong grape grappa), rages till the wee hours. The following morning, after a breakfast of pita (Bosnian pastries filled with either meat, cheese, spinach or potato), we drive on to the village of Martinbrod some 50km from Bihać. Scenically located at the foot of Una where it meets the canyon of Unac River, this is where the travertine (a terrestrial sedimentary rock) created numerous canals, rapids, islets, and waterfalls. We check out the biggest one, 25 meters high. Right next to it stands an abandoned half-destroyed house, a remnant of the brutal war in Bosnia. As I stand on the small wooden platform overlooking the waterfall, I picture a happier time in the past, when someone actually lived in this little house, falling asleep and waking up to the sound of rapidly falling water. I can only imagine how much that someone, wherever they may be in the world or beyond, must miss this sound.